Bishop’s Garden: Washington National Cathedral Collection. 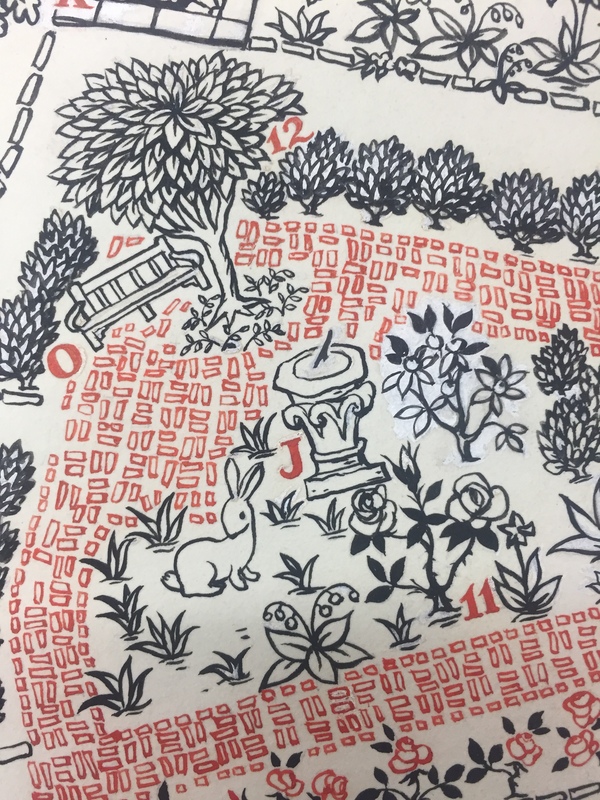 The Collections Department getting in the spirit of springtime with this playful illustration in our Washington National Cathedral Collection. Noted illustrator Grace Norcross Fisher designed this whimsical guide for the Bishop’s Garden, which includes a list of “Interesting Plantings” which can be found in the Garden as well as a guide to the “Historical Stone.” This guide is the original ink copy, likely completed in the 1950s. The famed landscape architect Frederick Law Olmsted, Jr. created the original plan for the Cathedral Close, the lands surrounding the Cathedral, in the early 20th century. 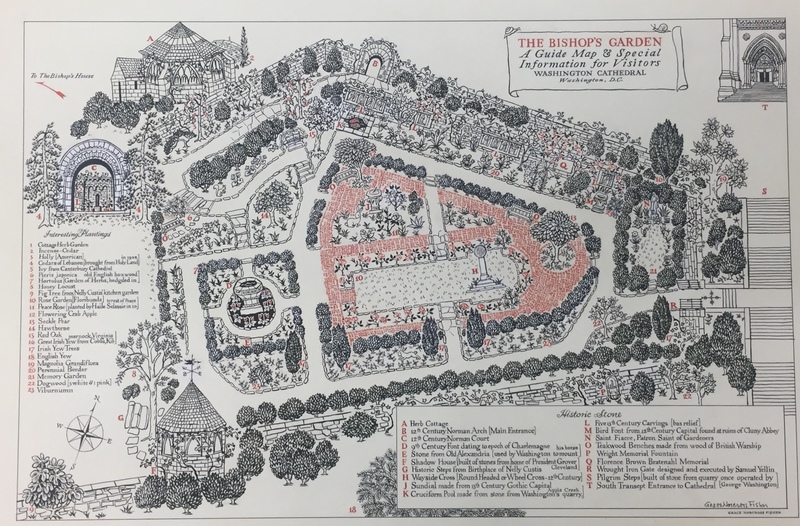 Landscape designer Florence Brown Bratenahl, who worked on the Close after Olmsted, brought her own vision to the Bishop’s Garden—including making the garden more accessible to the public. Rabbit At Sundial Washington National Cathedral Collection. A number of Bratenahl’s designs are called out in the guide, including the Pool of St. Catherine (complete with goldfish!) identified here as the Cruciform Pool. The guide also identifies a number of the unique plants that Bratenahl incorporated, including the boxwood shown throughout. Fisher’s guide also highlights how the rabbits, squirrels, birds, and even snails of northwest D.C. get as much enjoyment form the Garden as its human visitors and the space is presented as an oasis and place of peace and reflection. The Bishop’s Garden is maintained by the All Hallows Guild, an organization founded in 1916 to maintain the entire Cathedral Close. The Guild is highly active over a hundred years later as they work to both preserve the historic vision for the lands and gardens while making modern updates to fit with the changing climate and evolving cityscape. The National Building Museum’s Washington National Cathedral Construction Archives Collection contains a number of drawings for the Cathedral Close and the landscaped elements contained within. While all of these drawings are historically significant and many are stunningly beautiful, can you blame us for being particularly enamored with the one that features woodland creatures in a fairytale-like setting this time of year?